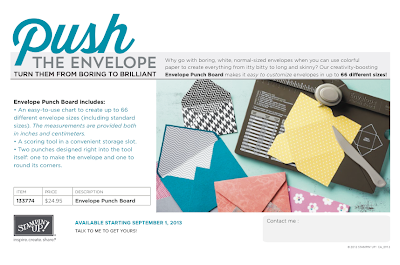 I'm so excited about the new Envelope Punch Board! This amazing new tool from Stampin' Up! allows you to create your own beautifully coordinating envelopes in 63 different sizes! Check out this short video to see it in action! To order the envelope punch board, email me or shop my online store 24/7! Enter code 74YPYZSJ and be entered to be selected as my Mystery Hostess earning yourself FREE product.